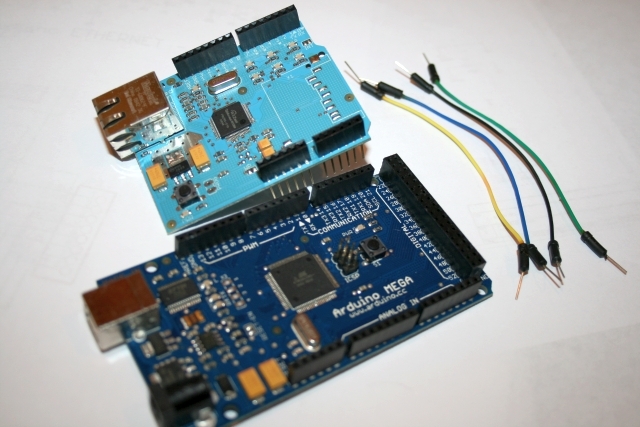 This is the assembly guide for the NKC Ethernet Shield for Arduino DIY KIT. 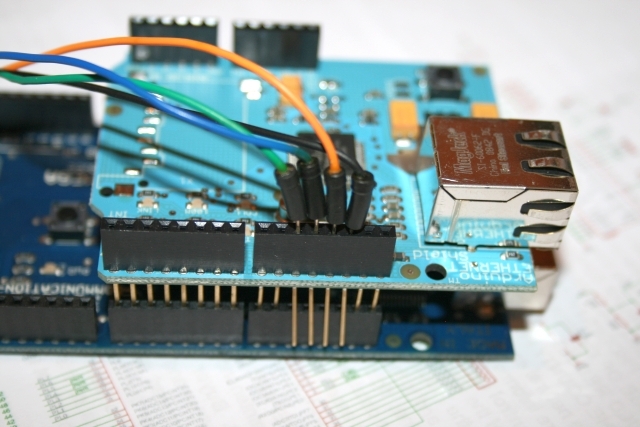 This shield is based on the WIZ812MJ module and shares the same W5100 TCP/IP chip with the official Arduino Ethernet Shield, making it 100% compatible. 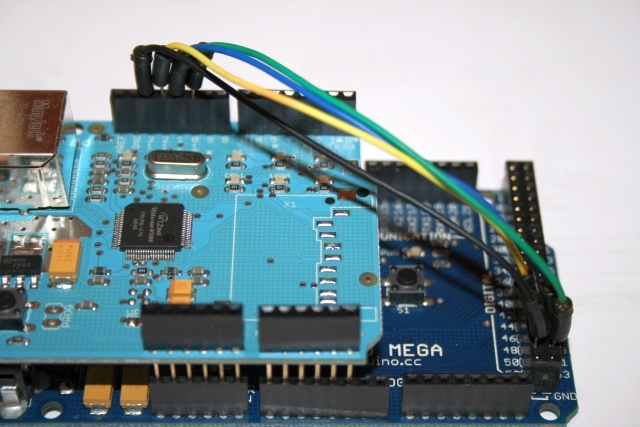 The current Arduino Ethernet Shield doesn’t work with the Arduino MEGA (a hack is possible, but some wiring is needed, as well as a small modification to the Ethernet library code). 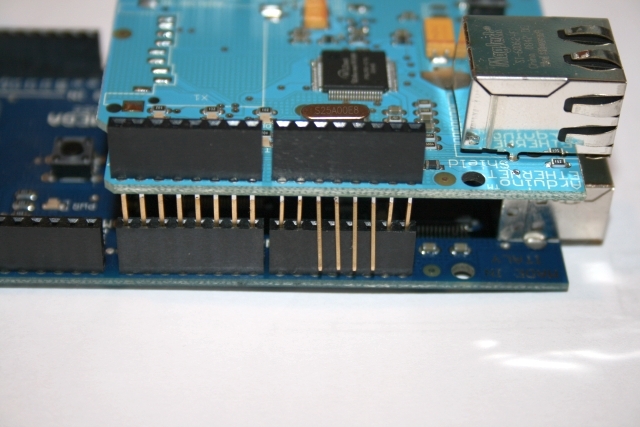 The NKC shield was designed to avoid this extra wiring and make it physically work with both the Arduino boards (and all its derivatives) and the Arduino MEGA board. Start by opening the plastic poach and removing all the components on the table. Select the PCB, the 3.3V voltage regulator (TO-220 format) and the 2 x 100uF electrolytic capacitors. Solder these components, make sure that the capacitors are correctly oriented, as they are polarized (long leg is positive, short leg negative. Also negative has a band on the capacitor body). Next proceed with the LEDs, resistors and tactile switch. 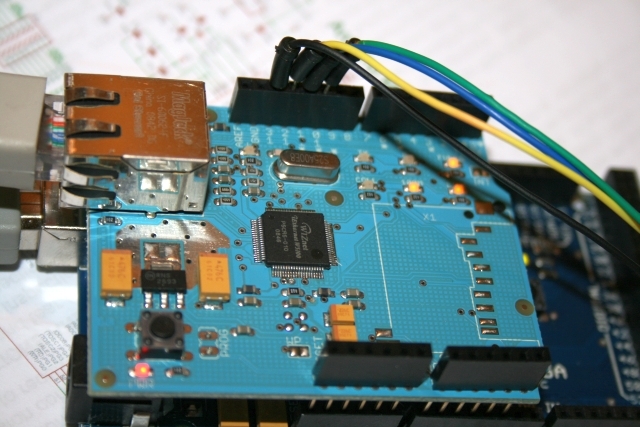 The switch is for resetting both the Arduino board and the Ethernet shield. The red LED is for LED13, the same LED13 that you have in your Arduino board is available on the Shield, as it indicates SPI activity. The 2 blue LEDs are for the Ethernet TX and RX activity indicators. The resistors are for limiting the current to these LEDs. Now solder the 4 2×5 female sockets. Before applying solder, make sure they are correctly aligned. It is time to solder the long legged pin headers: 2 x 8-pin, 2 x 6-pin and 1 x 2×3-pin (this one goes upside down!). There is also a 4-pin male header and a jumper or shunt. and the next step is to open the Arduino IDE, load some Ethernet library based sketch and enjoy your new Ethernet Shield. You can keep the jumper in the Duemilanove setting. 8. Compile –> upload sketch to the MEGA –> and Voila!!! 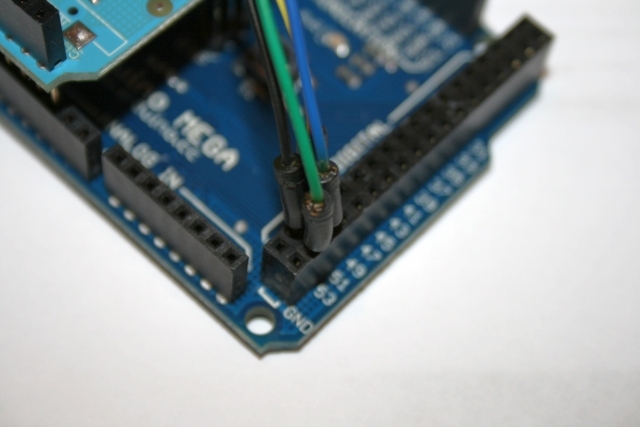 The jumper in MEGA position, together with the last pin (4) on the 4-pin male header, is when you cannot keep the SS signal (SPI) on Digital pin 10 and need to move it to the default position, which is digital pin 53 on the MEGA. The STM32 primer is an excellent tool to start playing with the Cortex-M3 based STM32 microcontrollers. The STM32 Primer features an STM3210B microcontroller (128 Kbytes Flash) USB connector, 128×128 color LCD, MEMS sensor, IrDA connector footprint, buzzer, LEDs and push button. It also has a solder footprint (2mm spaced) with some communication signals exposed. I created this weblog to document how this extension port can be used. Some signals are already used by the included peripherals, like the accelerometer. Please, verify the complete schematics available here (You need to register to access the resources documents). You can solder some wires to the footprint pins or you can solder a 2mm pin header, male or female. I have the 2×12 2mm female header (purchase), so I used it to create a socket for this hack. The socket is a through-hole component, so I bended the pins outwards to solder it as an SMD socket. 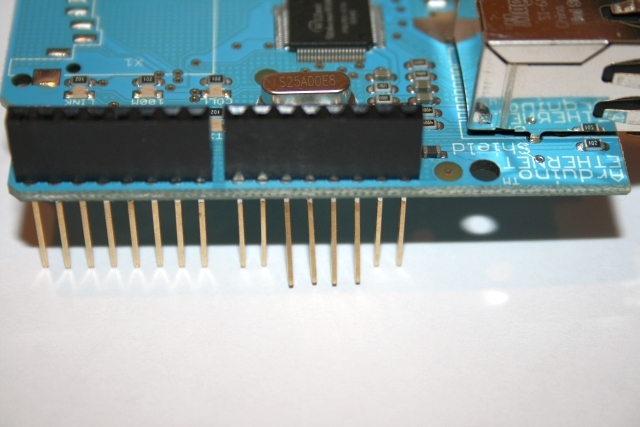 The SPI signals SCK, MISO, MOSI and SS are located in pins 13, 12, 11 and 10 on the Arduino Diecimila/Duemilanove or compatible boards like freeduino and seeeduino. These signals moved to pins 52, 50, 51 and 53 on the Arduino MEGA. Signals SCK, MISO and MOSI are available in the ICSP 2×3 pin header also, but signal SS is missing from this header, and only available on pin 53. As the Arduino Ethernet shield expects to get these signals from pins 13 to 10, we need to re-wire them to pins 50 to 53. Now the Hardware hack is complete, but there is one more change we need to do, as the original Ethernet Library included with the Arduino IDE has hardcoded the SPI signals. We need to change these hardcoded signals to match the new position in the Arduino MEGA. 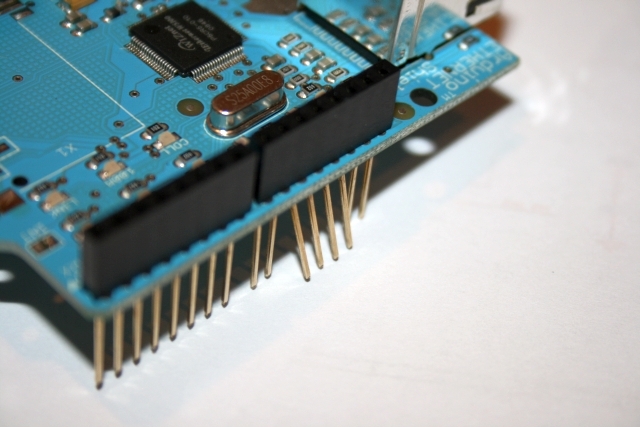 Locate the file spi.h in the hardware/libraries/Ethernet/utility directory, under your Arduino 0015 installation. These 5 lines are in a non-consecutive order in the spi.h file. After you save the edited spi.h file, remove all .o files in the utility and Ethernet directory. This concludes the Arduino Ethernet Shield MEGA hack. The previous hack requires moving 4 signals: SCK, MOSI, MISO and SS. As SS is used by AVR only when working SPI in SLAVE mode, I decided to try a new simpler hack, and move only 3 signals: SCK, MOSI and MISO, and use digital pin 10 as SS. This way, only 3 pins need to be bended: 13, 12 and 11. At the beginning this seemed to be a simple modification to the original hack, but mysteriously it didn’t work. 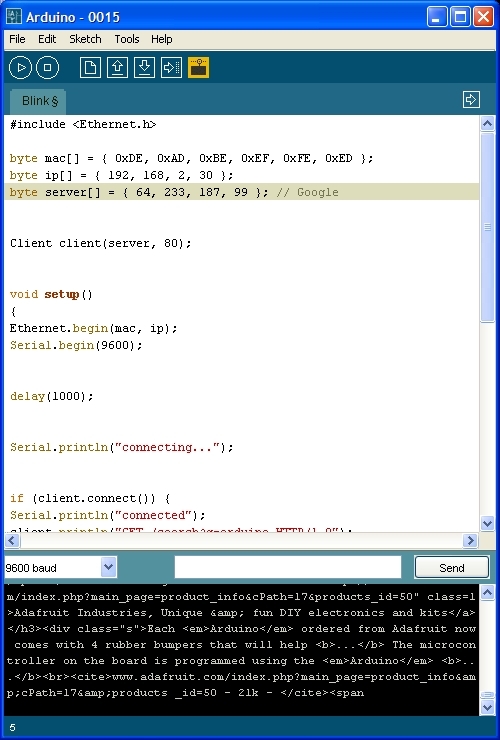 Assigning SPI0_SS_BIT and IINCHIP_CS_BIT to BIT4 (corresponding to digital pin 10 on the Arduino MEGA), the Arduino Ethernet shield couldn’t be initialized, so the sketch didn’t work (It never returned from Ethernet.begin()). After doing some research, I found that the SS pin is also used when setting AVR in SPI master mode, but only before setting bit 4 of register SPCR (Master mode) required this pin SS to be HIGH. So I tricked some more code to make it work (force SS HIGH before setting bit 4 in SPCR register to HIGH). Follow hardware hack instructions above, but only bend pins 13, 12 and 11. Wire the pins as instructed, except for the 4th wire from Arduino MEGA pin 53 to Ethernet Shield pin 10 (as this pin is not bended in this new hack). By adding BIT0, we force pin SS to be HIGH when the SPCR register is set for AVR to behave like SPI master device. I hope you find the new addition simpler to execute than the original hack. You are currently browsing the MCUKITS blog archives for April, 2009.